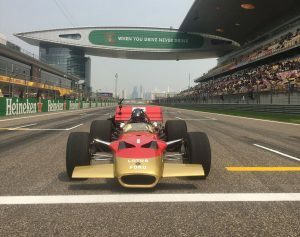 Classic Team Lotus are proud to announce Classic Team Lotus’s Type 49 was selected to appear in China, in celebration of the 1000th GP. Our very own Chris Dinnage is also there, overseeing preparation of the car, for parade laps driven by Damon Hill. Watch Damon drive the same car his father Graham drove to the 1968 F1 World title. 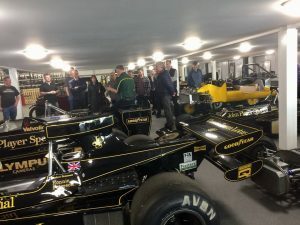 When I arranged for a return visit to Classic Team Lotus at their new Workshop and storage facility for Saturday 23rd March I had no idea how popular this would prove. With 25 places on offer to attend, within two days of the event being posted it was fully subscribed plus an increasing reserve list. 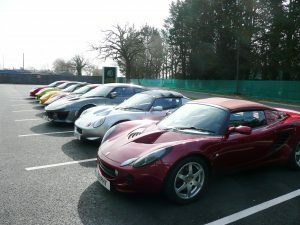 The day of the tour commenced with the local Essex area meeting up for a run from Colchester to Hethel with a ten car convoy which made for a great sight on a lovely sunny Spring day. 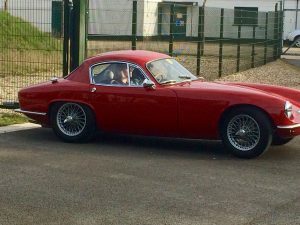 We duly arrived at the facility to meet with others who had traveled from different locations and awaited the arrival of birthday boy Michael Hipperson with his daughter Daisy driving his lovely red Elite type 14. Not to embarrass Michael we gave a rousing rendition of Happy Birthday as he walked across the car park to join us. Our host for the afternoon was Richard Parramint who greeted us all as we congregated in the main entrance (Shop) area and gave us an insight of the new facility before we commenced our walkabout. Starting on the ground floor it was evident that things have moved into the 21st Century for CTL from the original wooden huts adjacent to the new site. 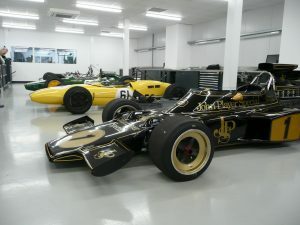 On entering the new workshop area we were among the cars currently undergoing restoration and preparation for this year’s racing events. It really was a case of a ‘child in a sweet shop’ moment as being able to get up so close to the iconic cars in various state of construction was simply amazing. Seeing my all-time favorite Type 25 in all its glory was the icing on the cake. 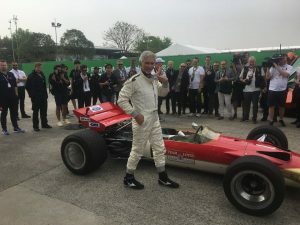 Richard was on hand to answer any questions that were put to him regarding the cars and their past drivers plus with his wit and humorous banter it made for an interesting insight into the past within the team in its heyday. 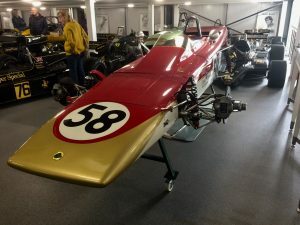 The workshop is a lovely clean working environment for the engineers and provides plenty of space for working on the individual cars which perhaps the old workshops couldn’t really offer. Making our way up to the 1st floor level, and this really was another level (excuse the pun), the vast array of F1 cars was outstanding and once again we were free to walk around and drool over pretty much the range of ex Lotus F1 racers from type 72’s, 49 and 99T that had the revolutionary active suspension, and so many more which are too numerous to mention. Needless to say everyone felt privileged to be amongst such motor racing history. 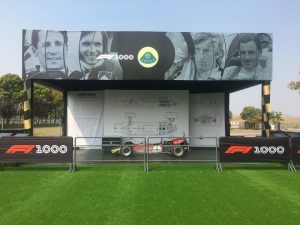 As part of our visit we had the opportunity for those who wanted to have one of the F1 cars rolled out for a photo opportunity to include the owner’s cars etc. 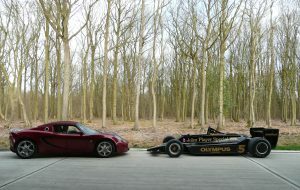 The black beauty we had was Ronnie Petersons Type 79 which made for great photos against the background of the wooded area as you can see from the picture. After approximately a three hour tour coming to a conclusion we reconvened in the shop area to spend some cash and wrap up the afternoon with Richard. After saying our goodbyes to those making their way homeward bound the rest of us headed off to the Breckland Lodge Hotel for a drink and lovely evening meal to finish off the day in style. 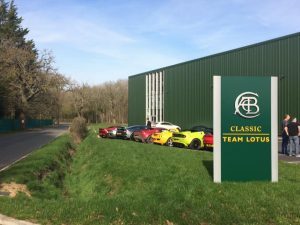 To sum up the event I hope that everyone felt it was a resounding success and on behalf of Seloc I would like to extend a big thank you to Richard Parramint and Classic Team Lotus for giving us this great opportunity to visit their new facility. Out with the old and in with the new – with the Evora Sport 410 being replaced by the Evora GT410 Sport, featuring the revised look of the GT430 Sport moving the standard Ohlin and titanium exhaust to the option list. 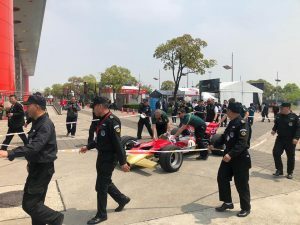 That defiant assertion is issued by an exhausted Dan Jude whose Lotus Exige has just staggered across the finish line at Anglesey after a torrid weekend of endurance racing in the bleakest corner of North Wales. 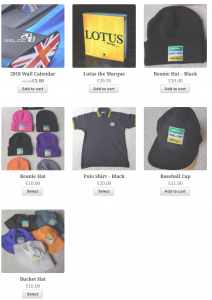 Race of Remembrance has rapidly ascended to a position as one of the crown jewels of the British club racing calendar. This year represents its fourth running, growing in length from nine hours to 12. 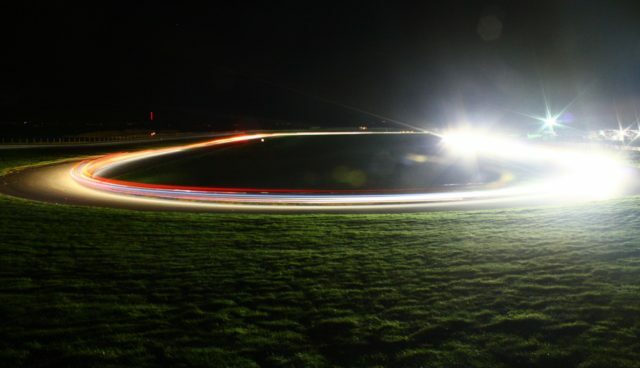 The event features a full grid of production sports and saloon cars ranged against the elements, each other and a circuit which features lethal fast corners as well as big braking zones into slow hairpins. It’s an unprecedented challenge – even the hardy spectators require significant endurance as bitter winds and rain batter the circuit from the Irish Sea. If you loved the sound of the GT430, but hated the spoiler and splitter, then good news! 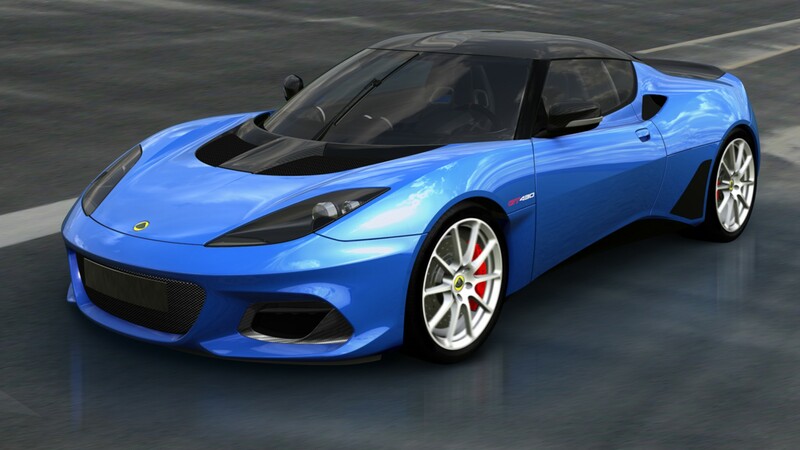 The Evora GT430 Sport has been announced. 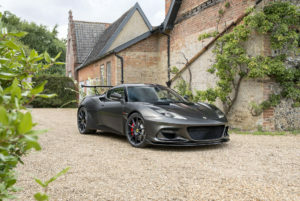 Dropping £8k from the asking the price whilst ditching the aero accessories (along with 10kg of weight) and bring the top-speed up to 196mph, the GT430 Sport does still retain the 430bhp derivative of the 2GR-FE engine, Öhlins TTX suspension and extensive use of carbon fibre and titanium components. 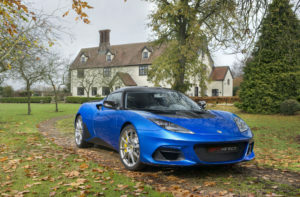 Lotus latest press release lauds financial improvements, with profits before tax for the second half of 2016/17 and predictions of a profitable 2017/18. Marking a major milestone in the history of Lotus Group International Limited (LGIL), the company finishes the financial year 2016/17 on plan. Lotus closed the year with positive EBITDA of £2.0m, a major achievement compared to 2015/16 where a £16.3m EBITDA loss was recorded. I collected my brand new Evora 400 last year. 13 months later I shot this video, detailing my thoughts and feelings about the car. I’m still in love with it, but the ride has not been easy. Lotus are re-opening their popular Lotus Driving Academy, offering customers the opportunity to develop their driving abilities on the companies renowned Hethel test track. The revised courses see the reintroduction of the popular entry “Scare Yourself Sensible” experience, among others. 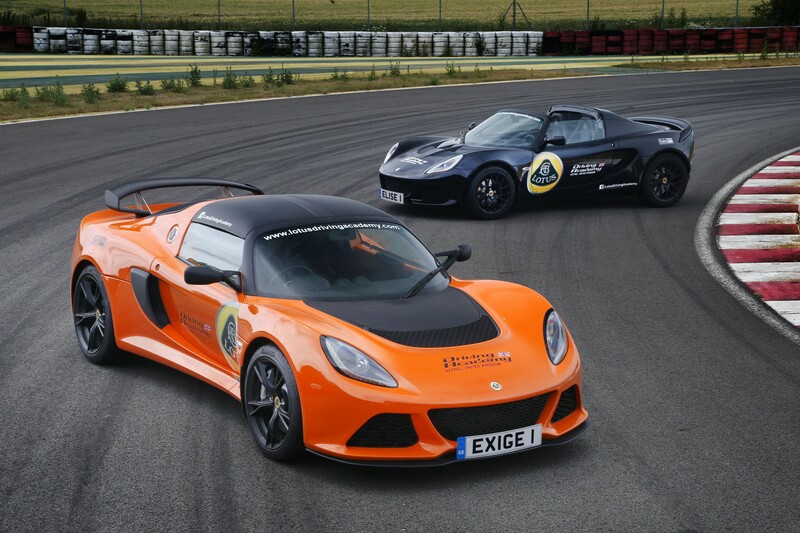 Drivers seeking the opportunity to experience the latest Lotus sports cars at the famed manufacturer’s facility in Norfolk, will now have the chance, with the opening of the new Lotus Driving Academy in August 2017. 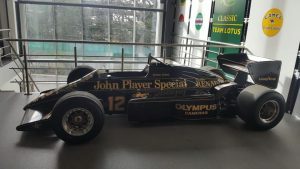 Anyone who goes to Hethel will know than an essential part of any visit is a tour of the Classic Team Lotus facilities. Later this year, they will be moving into a much larger and more modern purpose-built premises, but for the past 20 years they have been working from a series of small buildings left over from the site’s WWII heritage. 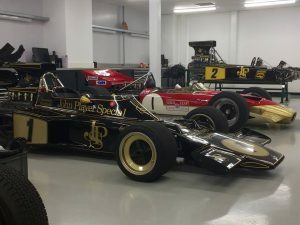 Last year I had the chance to sit down with the head of Classic Team Lotus, Clive Chapman (son of Colin) and talk to him about the challenges of maintaining a fleet of heritage racing vehicles. 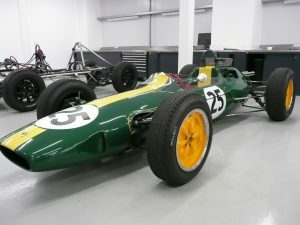 What’s your favourite classic racing Lotus?